What You Get: A former B&B with two barns, offering excellent income potential. The House: The massive house is 4,558 sq. ft., with 6 bedrooms and 4 bathrooms, plus a loft with an office/den combo. The great room is stunning, with floor to ceiling windows offering gorgeous mountain views. The upper deck is ideal for entertaining or relaxing. The Barn: There are 2 barns, each with 8 stalls. One barn is heated, with a wash stall and a tack room. There is also a 85’x130′ outdoor area with high performance footing and 9 paddocks. 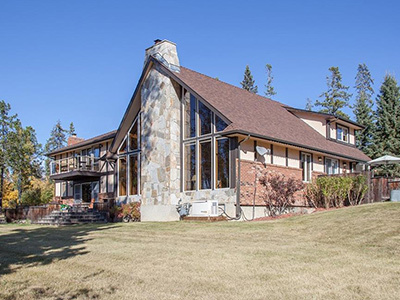 The property is next door to the riding trails of Kananaskis Country and is 15 minutes to Spruce Meadows.